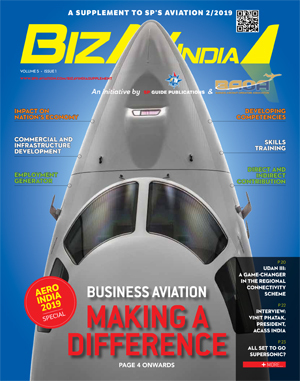 Beechcraft Corporation, a subsidiary of Textron Aviation Inc., a Textron Inc. company, today announced at the Middle East and North Africa Business Aviation Association (MEBAA) conference in Dubai that the company is now offering Pratt and Whitney Canada PT6A-67A engines for improved performance on its King Air 350HW and King Air 350ER turboprops. In addition, the company is offering an increased gross weight option for these platforms, increasing the maximum takeoff weight to 17,500 pounds. Both enhancements are now FAA and EASA certified and offered as factory options for new aircraft or as aftermarket modifications. 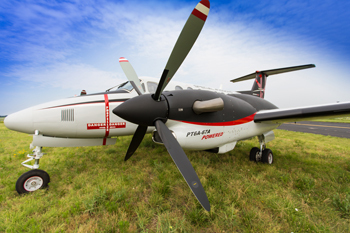 The more powerful Pratt and Whitney Canada PT6A-67A engines provide superior field and climb performance, including hot and high operations. With an outside air temperature of 50 degrees Celsius (122 degrees Fahrenheit), the engine upgrade allows for a maximum takeoff gross weight increase of up to 2,700 pounds at sea level, compared to the standard aircraft. The increased gross weight option provides operators greater flexibility between payload and fuel, representing a potential increase in loiter time of two to three hours. The King Air 350HW is a Heavy Weight (HW) version of the King Air 350 that provides operators an increased gross weight through larger and stronger main landing gear struts, wheels, tires and brakes. The King Air 350ER is an Extended Range (ER) version that includes the enhanced landing gear and increases the fuel capacity through the addition of low drag metal fuel tanks aft of the powerplants. 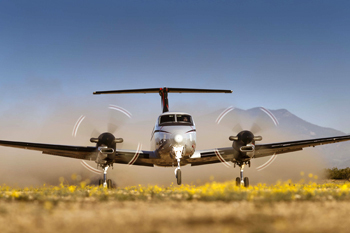 More than 7,300 Beechcraft King Air turboprops have been delivered to customers around the world since 1964, making it the best-selling business turboprop family in the world. The worldwide fleet has surpassed 60 million flight hours in its first 52 years, serving roles in all branches of the U.S. military and flying both commercial and special mission roles around the world. When customers need airborne solutions for their critical missions, they turn to Textron Aviation – home to the industry-leading Beechcraft and Cessna brands. Textron Aviation offers the broadest lineup of special mission platforms in the industry with its entire product range available in special mission configurations, using innovative technologies and advanced engineering techniques. Textron Aviation’s family of aircraft, including single and multi-engine pistons, turboprops and Citation jets, provide the high performance and flight characteristics required to fit mission profiles such as air ambulance, float operations, flight inspection, aerial surveillance, training, utility transport and more. All aircraft are backed by the industry’s most capable global service network.